I love a good surprise. And Maggie Stiefvater pulled off an excellent one this year by surprising her readers with not one, but two books. The one we'd been expecting for a year, the other we had no clue was even in the works really. And so when the cover of The Scorpio Races was released, my mind went in a hundred different directions at once trying to parse out the possibilities behind such an interesting title and such an absolutely lovely cover. The truth is, I didn't want to know that much at all. This was a surprise book, and as such I wanted to go into the first page uninformed as to the particulars. So I stayed away from synopses, snippets, even the trailer (and I adore her trailers), because I didn't want to go in with any kind of preconceived notion. Unable to attend BEA this year, I bemoaned the fact that I would miss out on the stacks of ARCs I knew would be available there. Fortunately, someone who knew I would be suffering went and picked me up a copy and popped it in the mail so I could get an early sneak peek. Sean Kendrick knows this truth only too well. It forms the fabric and the boundaries of his life. He races in the Scorpio Races every year and, for the past four years, he's come home the victor. More importantly, he's lived to race another day. Not everyone can say the same. Puck Connolly is racing for her first time this year. It's not so much by design as by way of keeping her older brother Gabe from leaving them. It's been just the three of them for years now, and Puck and her younger brother Finn can't fathom how they will go on without Gabe there to look after them. And so it's the races for Puck. If she puts her life on the line by entering (the first girl ever to do so) perhaps her older brother will think better of leaving and starting a new life on the mainland. Because the Scorpio Races aren't even remotely like your average horse race. In the Scorpio Races, the riders ride the dreaded capaill uisce--deadly water horses thrown up (or caught) from the sea. Faster, bolder, deadlier than any normal horse, they will kill you as soon as look at you. And Sean Kendrick is the only man around who is able to control them. If you can call it that. He has a way with them, can whisper in their ears, and anticipate their thoughts. And so these two young people are linked together by the races, by the fact that the capaill uisce took the lives of their parents, and by a spectacular love for horses and for the island that is their home. "Your brother is going to the mainland," Sean says. I hold my breath in my mouth for a long moment, and finally say, "Right after the races." There's no point in treating it as a secret; everyone knows. He already heard me talking about it with Gratton in the truck. "And you're not going with him." I'm about to answer he didn't ask but I realize before I do that that's not the reason, anyway. I'm not following him because this is home, and everywhere else isn't. "No." It's a lovely answer and takes me entirely by surprise. I hadn't realized we were having a serious conversation, or I think I would've given a better reply when he asked me. I'm surprised, too, by him including his stallion in his list. I wonder if, when I talk about Dove, people can hear how I love her the way that I can hear his fondness for Corr in his voice. It's hard for me to imagine loving a monster, though, no matter how beautiful he is. I remember what the old man said in the butcher's, about Sean Kendrick having one foot on land and one foot in the sea. Maybe you need a foot in the sea to be able to see beyond your horse's bloodlust. "It's about wanting," I say eventually, after some considering. "The tourists always seem to want something. On Thisby, it's less about wanting, and more about being." I wonder after I say it if he'll think I sound like I have no drive or ambition. I suppose in comparison to him it must seem that way. I seem at once cursed to say precisely what I'm thinking to him and unable to tell what he thinks about it. He says nothing at all. We watch the horses mill and surge below us. Finally, he says, not looking at me, "They'll still try to keep you off the beach. It won't have ended last night." "When the races are about proving something about yourself to others, the people you beat are as important as the horse you ride." His eyes don't leave the piebald. "But that's not what they're about for you." Sean pushes up to his feet and stands there. I look at his dirty boots. Now I've offended him, I think. He says, "Other people have never been important to me, Kate Connolly. Puck Connolly." I tip my face up to look at him, finally. The blanket falls off my shoulders, and my hat, too, loosened by the wind. I can't read his expression--his narrow eyes make it difficult. I say, "And now?" Kendrick reaches to turn up the collar on his jacket. He doesn't smile, but he's not as close to frowning as usual. "Thanks for the cake." Then he strides off across through the grass, leaving me with my pencil touching my paper. I feel like I've learned something important about the race to come, but I've no idea how to write it down. It's such a beautiful story. Ponderous, yet filled with bright dots of humor here and there, it moves, strums, and throbs through you with a feeling of ancient inevitability. The Scorpio Races feels like a throwback to the fantasy novels I read as a girl, which still seem, somehow, so much realer than everything else. There were a few pages so perfect, I simply stopped and held them in my hands. Like the island of Thisby, this book will take you, if you let it. Recommended utterly without reservation, especially for fans of The Blue Sword and Fire. The Scorpio Races is due out October 18th. The gorgeous trailer once more for your viewing pleasure. Having read the book now, I can tell you this trailer is just like this book--perfect. I loved this too. Maggie Stiefvater is just beyond wonderful! It sounds interesting but I wasn't fond of Shiver and I'm getting so tired of books written in present tense...Would you still recommend it? 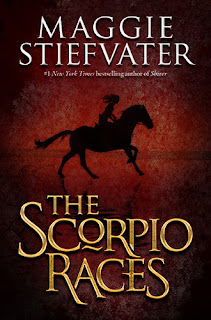 I already have my copy of "The Scorpio Races" preordered and I'm super excited for the book because it will be my first from Stiefvater. Her other books don't interest me, but this one sounds so great and after reading your review I'm even more excited to get & read the book. I've had my eye on this for a while now and your review has completely sold it to me! I have yet to read anything by Maggie Stiefvater, but it sounds like this may be the one that pushes me over the edge. I preordered this from Foutain books and I can't wait for it to arrive! So looking forward to it. I'm so excited to read this. Loved your review! I think Stiefvater's writing is beautiful...glad to hear this book lives up to that. rhapsody, that is the truth. Jenny, yes, I would. It's really nothing like SHIVER at all. Though it is told in present tense, it didn't wear on me. The writing style is quite different as well, so you might give it a go to see. Rida, exactly. It really is. I love it when an author does that and surprises me. Sabrina, ooh. I am excited for you and definitely looking forward to hearing your reaction. Jo, aw, thanks! It's superb. Carol, do it. This is a lovely place to start, IMO. Faith, oh, hope it finds its way to you very soon! Definitely interested. Despite my love of the Blue Sword and Arrows of the Queen, I have to admit I've grown really cautious about any books that involve horses. Especially special horses that people bond with. Though it is nice they also appear to kill people. First person and present tense--though not always together--have been lit. trendy of late. This is the good and the bad. The good--they are some of the hardest povs to sustain but are immediate and visceral when done correctly. For a while, no one tried them and the few who did could be told they weren't playing by the rules. The bad--they are some of the hardest povs to maintain so now that people are getting hip with it, too many books are written that way that um, shouldn't. Either due to story or due to the fact the writer needed to practice and understand the difference in craft first. I completely agree with it being the best book of the year for me too. ;) I wish I could shove it into everyone's hands! Bets, I hear you about the horses. Though I don't shy away from horse books as much as I do horse movies, I still tread with caution. Fortunately, this one is very much in the vein of THE BLUE SWORD. And I'll agree, the killer aspect adds a lot here! :) I appreciated your thoughts on first person, present tense as well. I think it's so hard with these trends, because it shouldn't be attempted, as you say, unless it can be done well. This one, as it happens, is well. Amanda, my pleasure! Can't wait till it's out. This sounds more than excellent! All I've seen so far is very enthusiastic positive reviews, and since I've enjoyed her wolves trilogy, I just have to read this one! I bought it and downloaded it to my Nook today (with your other suggestions). Can't wait! I'm sure I'll be hunting for a sweet, buttery cake somewhere in Orlando! kay, you have to. It's just all kinds of excellent. Sigh. Sometimes I just wish you would hate a book so my TBR stack would shrink. 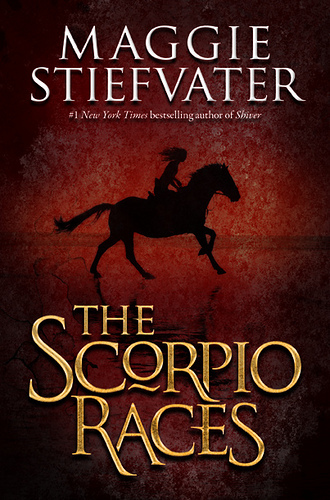 ON THE OTHER HAND, I am excited for the possibilities The Scorpio Races brings, I CANNNOT WAIT to read my copy. As always, I'm totally sold. While I'm writing it, go read THE SCORPIO RACES. It's special. Stiefvater -- or other paranormal-romance writers -- have ever created.